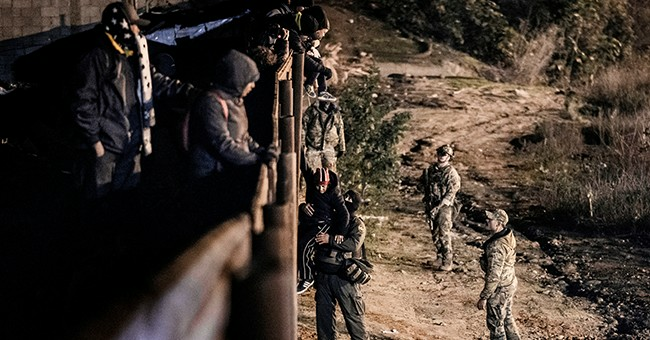 While this may not be a popular sentiment, there’s one positive outcome from the current showdown over the border crisis: Significantly increased attention now focused on the threats at our southern border. This strategic focus is much-needed, because for too long, our nation’s strategy for Central America and our hemisphere has drifted – as circumstances have only worsened with the plight of families fleeing gang violence and poverty along with growing threats from human traffickers and narcoterrorists. President Trump has rightly called the situation at our southern border a “growing humanitarian crisis” and the first duty of the Commander-in-Chief is to protect the American people. Ultimately, Democrats and Republicans need to put country over party and find a compromise out of this stalemate to advance our national security interests and get the full force of the federal government back to work and firing on all cylinders – from the TSA to the DEA to the State Department. America’s leaders should do so today. Yet as we tackle the crisis at the border, we would be short-sighted to not look beyond the 2,000 mile stretch that separates us from Mexico – because to keep our nation safe, we must tackle threats both at the border and the regional and global threats we face before they get close to our shores. As we resolve the current political impasse, I’m hopeful this is a moment for America to step up its game and to press our Central American neighbors to do the same, because as this current crisis demonstrates: Non-action is a non-option. The good news is America knows how to do this – we’ve got the talent, the skills, the experience, and the leadership. Because, the crisis we face today is not that different from what our civilian and military personnel achieved in helping turn around Colombia more than a decade ago. A while ago I returned from a country I know well from when I was a young Captain. Back during some of Colombia’s more chaotic years, I helped manage the U.S. Air Force’s foreign military sales. While it’s no secret Colombia is far from perfect today, the once narcoterrorist state has dramatically transformed over the last decade into a strong U.S. partner and export market. We invested close to $10 billion in security and economic assistance to combat the drug war and promote economic growth. It was a sustained campaign that America committed to for the long haul. Today, violence in Colombia has reduced dramatically and American exports have quadrupled to more than $19 billion in 2017, an annual return that is nearly double our total investment. In the president’s National Security Strategy, he declared that “economic security is national security.” I couldn’t agree more – and clearly the same holds true for countries in Central America. On the ground today, we see the outlines of an effective strategy in programs run by the U.S. Agency for International Development (USAID) alongside our nation’s NGOs and faith groups: In neighborhoods in Honduras where USAID operates, homicide rates have plummeted by up to 78% – reducing a key driver of migration. In El Salvador, we’ve helped the nation reform their own tax system increase its annual revenue by $350 million and strengthen social programs. In the Western Highlands region of Guatemala – an area where U.S. Customs and Border Protection tracks a high volume of migration – USAID’s agriculture programs have helped increase rural farmers’ sales by 50% and create 20,000 local jobs. Those are results that any Commander in Chief would appreciate. While these efforts to advance security, promote good governance, and create economic opportunity are effective and working, they simply are not happening on a large enough scale to stem the tide. Unfortunately, while policymakers on both sides of the aisle have talked a good game in recent years of stepping up our engagement in the Northern Triangle, American resources to do so have shrunk by 20% since 2016. For a strategy like this to be successful it not only takes effective resources, but it also takes country ownership and accountability on the ground. That’s why U.S. pressure is so essential, building on the impressive engagement by key leaders in President Trump’s cabinet over the last two years to strengthen our engagement with Central America. This partnership – called the Alliance for Prosperity – has helped mobilize close to $5 billion from countries in the Northern Triangle. This is no small feat, and the U.S. can and should do more to invest and hold these countries accountable. As a former Air Force bomber pilot and later having the privilege to serve as a General Officer, I readily admit that partnership is tough – whether at 30,000 feet or on the ground. But time and again in uniform, I witnessed firsthand when other countries do in fact step up to the plate, it’s almost always because America led the way. Given the very real threats we face at our border and beyond, that’s a mission worth fighting. A command pilot with nearly 3,000 flying hours, Lt. General Richard Y. Newton III served for 34 years on Active Duty, culminating a distinguished career as the U.S. Air Force Assistant Vice Chief of Staff.